Whisk egg yolks, sugar and Marsala in the top of a double boiler, over boiling water. Reduce heat to low, and cook mixture for about 10 minutes, whisking constantly. Remove from the heat and whip yolks until thick and lemon-colored. Then, allow to cool, about 20 minutes, before mixing in mascarpone cheese. Meanwhile, to make the whipped cream, in a separate, chilled bowl, using an electric hand mixer, whip cream to stiff peaks. Next add mascarpone to sabayon and whisk until completely incorporated. Then, gently fold the whipped cream in the sabayon. 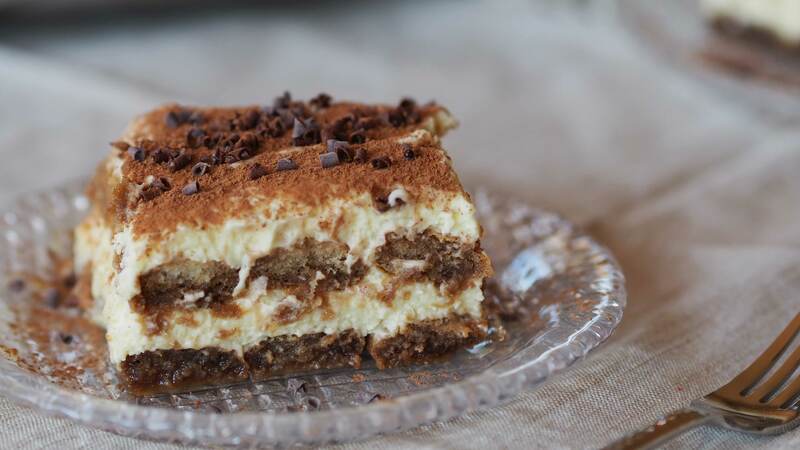 Set aside until ready to layer tiramisu. In a medium mixing bowl, mix the cooled espresso with the coffee liquor and espresso tequila. Dip and turn the ladyfingers, one at a time, into the mixture, for 2 to 3 seconds, then arrange them in the bottom of a 9-inch square baking dish. Check the layer of ladyfingers to ensure each one is sufficiently soaked with the espresso mixture without being too mushy. Carefully drizzle extra espresso mixture on the parts of the lady finger that needs additional liquid. After placing the first layer of ladyfingers, spoon half the sabayon whipped cream filling on top. Then, repeat layering process by soaking more lady fingers and arranging them over the top of the cream filling. Next, add the rest of the sabayon whipped cream filling on top of the soaked ladyfingers. Cover with plastic wrap and refrigerate at least overnight and up to 3 days. Before serving, dust with cocoa and garnish with chocolate shavings.